The Gulf State Park Enhancement Project announced today that it has applied to team with Hilton Worldwide for a planned lodge that was destroyed by Hurricane Ivan and is part of a broader effort at the park to be an international model of economic and environmental sustainability in the wake of the damaging 2010 Deepwater Horizon Oil Spill. Hilton would support the booking of meetings, weddings and vacations, helping to welcome everyone and improve public access to the park. The lodge, as part of the Gulf State Park’s enhancement plans, will demonstrate sustainable best practices for outdoor recreation, education and hospitable accommodations, values that Hilton Worldwide supports. The application process takes several months before it can be final. 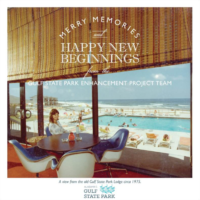 But the filing is a symbolic first step toward rebuilding what will be called the Gulf State Park Lodge, a nostalgic tribute to the facility’s predecessor that generations of Alabamians enjoyed. The Gulf State Park Enhancement Project will provide ecologically sensitive enhancements to the 6,150-acre park located in Baldwin County, Alabama. This stretch of coastline runs from Gulf Shores to Orange Beach, and is operated by the Alabama Department of Conservation and Natural Resources. The Gulf State Park Enhancement Project consists of enhancing the visitor experience, restoring the dunes, building an environmental information center, creating a research and education center, along with rebuilding the lodge and many other visitor benefits.